It took us a while to get this rolling. 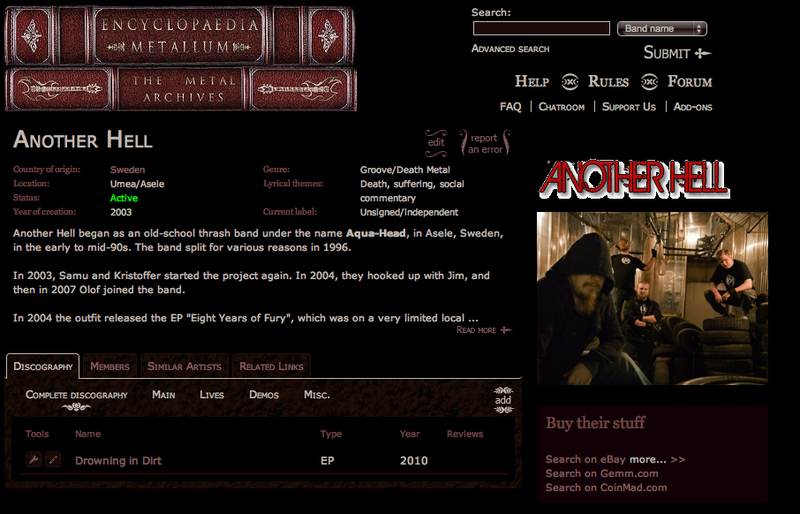 If you’ve never submitted bands to the Metal Archives before, you’re in for a treat. It takes forever to get all the details together. And then if you get something wrong, you won’t be listed. And for all you bands who just release your music digitally, you have no chance of being listed in the archives. They only list bands with physical releases. Anyway, I’m glad I got my boys listed. If you’re not in the Archives, you are pretty much invalid. When I was working primarily as an editor/critic, a listing in the Archives went a long way with me. It’s the central go-to for bands. If bands weren’t in there, I could never take them seriously. Check out Another Hell on the Archives here. Next article Another guitarist bites the dust. RIP Cory.